Block Print patterns come assorted but you can choose the main color of the piece. Hippie clothes. Bohemian clothing. Artsy clothing for creative people who aren't afraid to show a little color! 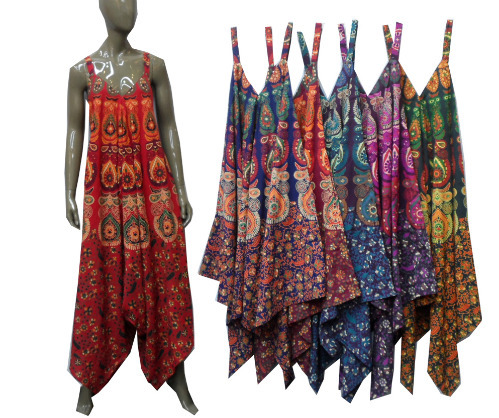 100% Cotton heavier weight cotton block print baggy harem jumpsuit. The fabric of this jumpsuit is the same fabric the wrap skirts are made of. This style is very oversized and would work best on a larger frame. The straps are NOT adjustable, however there are small hook and eye closures under the arms and in the back to accommodate smaller frames. Our experience with these tiny closures is that they might need some reinforcement with needle and thread if you plan to use them. We think this style looks best with a tee or tank worn underneath like overalls. The design of this jumpsuit is very simple yet elegant. A 70X50 inch rectangle of fabirc block printed, then folded in half, and split in the middle. Simple straps are added in the center and the entire style of this jumpsuit is created when the two sides are allowed to fall down on either side creating the dramitc drape and flow to this piece. Amazing! These jumpsuits are very trendy right now. The harem leg style is cut so that it is shorter on the sides and longer in the middle. Please check the length of this jumpsuit to get an idea of how it will fall on you. A great addition to any bohemian wardrobe. Block Print patterns come assorted but you can choose the main color of the piece. Check the measurements below.